Right now, enjoy 20% off regular pricing until 12/31/18. 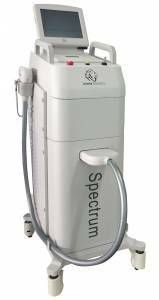 Our new device called the Spectrum from Rohrer Aesthetics. It utilizes the most effective tools for hair, tattoo, and facial/leg vein removal, as well as Erbium skin resurfacing and IPL to treat acne and photodamage. Erbium LASER skin resurfacing to erase sun damage and improve skin texture on the face, neck, décolleté, arms, etc. Intense Pulsed Light to treat red and brown sun damage on the face, neck,décolleté, arms, etc.